The subject of this essay is subtly but significantly different to that of the previous one. When we live into the archetype we are implicitly acknowledging responsibility. With the idea of the human form I am seeking out that way of being and knowing ourselves which allows us to escape the tension of the individual. The archetype of the human being only makes sense as a generator of growth and development. To find the human form is to feel the motion more outwardly, more at the surface, more in the moment. Let me begin by looking at the way we use, in English, words for parts of the body in other contexts, as metaphors, for form is about the configuration of parts. In the use of language, head, heart and hand are large – are frequently used and given significance. Toe and foot are tiny in their usage. ‘Head’ often appears as the leader, and a leader who is detachable, while ‘heart’ is always the centre, the middle, and ‘hand’ is about many different kinds of interaction. You may be familiar with the maps of the brain, of the somato-sensory cortex and the motor cortex which indicate areas of representation in the cortex of various parts of the body, indicating by size of representation how significant the different parts of the body are in movement and perception. There are similarities between the two maps – lips, tongue, the hand, and in particular the thumb, have large representations, the trunk a relatively small representation. Here sensitivity goes, in most cases, with precision of movement. I mention these maps in order to distinguish them from the cultural form of the body expressed in language use and metaphor, in order to make clear how, in different ways, we live with the idea of the human form. Cortex and Culture are both of interest. In the use of the word ‘form’ itself we can trace a complicated process by which ‘form’ changes from something within a thing, sustaining it, making it what it is and different, changes to mean something external, fixed, liable to lack real inner life. For Francis Bacon in 1600 to understand the form of something is to give one the power to control or produce it; two hundred years later, for Immanuel Karl, the form is the order I bring to the world through my need to know. The form is also the outward shape: but means something more with horses as I watch them being readied for the race and decide where to place my bet. We start with the parts, with the surface. Can we get to the whole? In the last essay I introduced two sculptors who in their different ways were freed by drawing. In this essay I bring in two painters who brought a sense of sculpting to their work with surfaces: Henri Matisse and Pablo Picasso. These two are often spoken about together, and contrasted. Matisse, twelve years older than Picasso, was born in 1869 and lived until 1954. Picasso lived to an even greater age, dying in 1973. It’s hard for me to believe that I was already in my twenties when Picasso died, for he seems to belong to a time long gone, the last of those whose individual creative genius could be separated from their fame or even their influence. The contrast that is usually made, and which has substance, is of Picasso as the violent, aggressive revolutionary, and Matisse, also seeking liberation, but tending towards reconciliation, satisfaction, harmony of colour and composition. The two would have known of each other for several years when they met in 1905 or 1906 and in the painting of Matisse which was then causing a stir, ‘Le Bonheur de vivre’ the circle of naked female dancers appears which becomes so striking an image in later work. 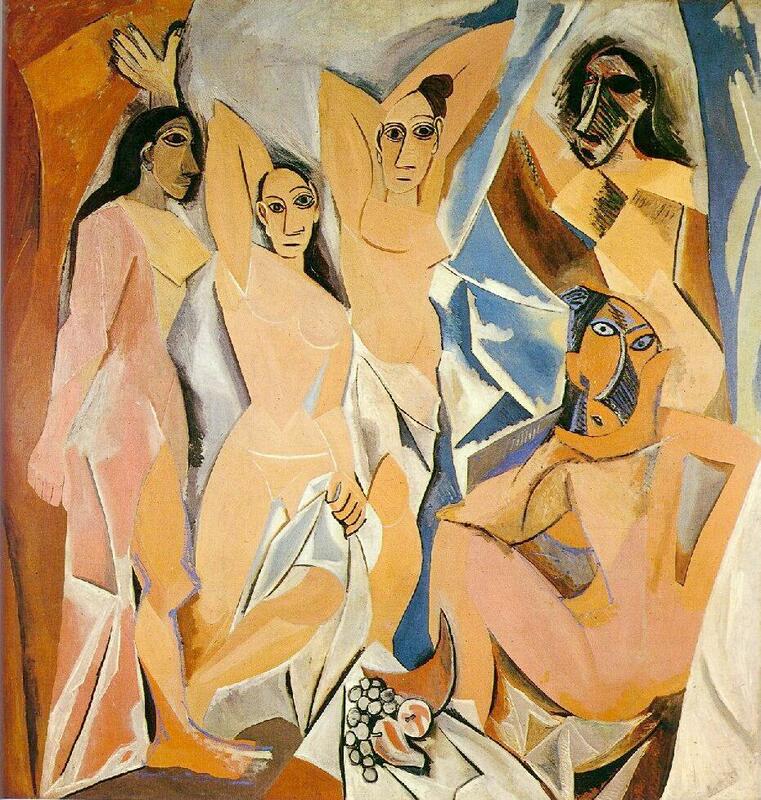 A year later Picasso painted the shocking and grotesque women of the painting we now call ‘Les Demoiselles d’Avignon’. In the autumn of 1907 they each chose a painting by the other. Matisse chose a still life by Picasso which sculpts the space of the painting, drawing the attention to the pitcher, bowl and lemon at its centre. Picasso chose a naïve, muted ‘Portrait of Marguerite’ in which the composition and form of the flat bounded surface is what matters. The grace of the Matisse is the grace of the living made abstract on the canvas – the abstraction is not violent but revealing life. I want now to move on to the last years of his life, when, physically limited, Henri Matisse developed the art of the cut-out, and in so doing revealed the dimension of experience I am calling the human form. Cut-outs, using all kinds of materials, had a history, in the wish to be subversive, coming from Picasso and others in the early years of the twentieth century. Matisse came to them in a new way as he attempted to compose an enormous ‘Dance’ mural in the 1930’s and used pieces of cut out coloured paper, which he could move around, to explore the composition. In the 1940’s he developed the cut-out as his own art form, pre-colouring paper with gouache and then as he described it in the text of ‘Jazz’ – “Sculpting the living colour” which “reminds me of the direct carving of the sculptors… my curves are not mad”. He sculpted with scissors or as he also said, he could “draw in colour. For me it is a question of simplification, instead of drawing the outline and establishing colour within it. I draw directly in the colour” (MC, p 10). As he worked with the movements of dance in the cut-outs, joie de vivre is the only possible phrase to use. Matisse identifies dance as the expression of this joy – “it was like a rhythm within me that carried me along” (MC, p 67). 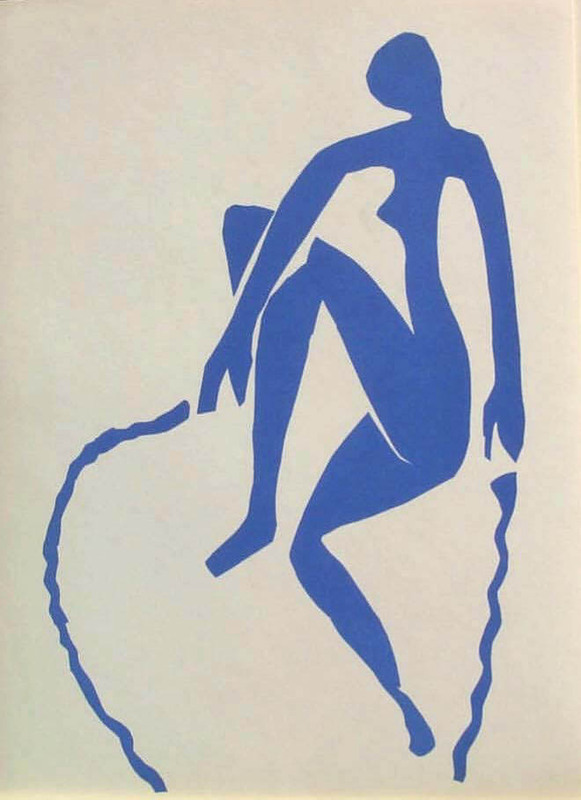 There is a series of blue cut-out nudes which have amazing plastic agility coupled with a clear compositional refinement. This makes them very immediate, vast, yet also impersonal. There is tension, tension implicit in the decisive act of cutting, but it is a tension of surprise and liveliness. The other kind of cut-out which Matisse explored in his last years involved coloured fragments (again cut-outs) on variegated backgrounds, exploring form and colour, space and light. Space is always there, the figures arise out of space, and Matisse is full of the joy of entering into the object through the act of cutting. In the huge compositions of his very last years you find this joy fulfilled. The simplicity of the forms brings release and freedom – for the form depicted, for the artist in the cutting of the colour, for the one who sees. Michael Gill speaks of these cut-outs having “pure patterns of pleasure. Here the body is without the connotation of biographical guilt and anxiety. So we experience it in our few moments when mind, spirit, and physique come together in an effortless harmony” (IOB, p 423). This is one thing we are after through the Alexander Technique – living in the human form. How can we educate the imagination to be able to enter in? How do we find the rhythm? Energised by this celebration of joy and life I feel able to look at the important elements of the human form – the parts which become incorporated – with the hope that movement is not lost in abstraction. This next section is really a tribute to one man, Wolfgang Schad, who in the 1970’s produced a book translated as Man and Mammals: Towards a Biology of Form which is a ground-breaking classic work of perceptive intelligence. It is clear and accessible and has given me life-enhancing insight into animals, and the form of the human being. He looks at many different mammals and reveals the unique quality of each within the context of other mammals. The human being stands out in his view as the creature in whom the three fundamental functional processes or systems are balanced: the nerve-sense system, the rhythmic-circulating system, the metabolic-limb system. These three are each centred in a particular region of the organism but penetrate each other and the whole of the organism. They are not anatomical features, but systems or even qualities which combine and act together within each part or region. This view begins with the whole, the animal species, in which the particular qualities of its interpenetrating parts belong together and belong with the environment in which it lives. I want at this moment simply to bring to your attention some of Wolfgang Schad’s insights regarding the human being. He contrasts the immobile and, for the most part, unmoved head – “Above the runner’s flashing limbs and panting breast, his head quietly keeps the goal in view” (MM, p 17): he contrasts this with the bodily activity of the limbs and organs of the abdominal cavity, where the organism’s autonomy, physiologically, digesting what is taken in, is maintained. The head is bony, enclosed, the abdomen unprotected, the limbs jointed with bones as levers not as protection. There is though greater complexity in the human being than simply, say, the polarity of the outward-directed senses of the head and the inwardly-orientated metabolism of the abdomen. Through the limbs the organic activity goes out into the world, and the central nervous system, focused in the brain, is establishing the private existence of the individual. There is a fascinating contrast between the symmetry belonging to the senses and the limbs, expressing the organism’s connection to the environment, and the asymmetric forms of the main organs, developing out of early developmental symmetry through a variety of spiralling and twisting movements which belong to the inner space of life. A different kind of inwardly-directed asymmetry belongs to the brain, both in shape and function. Wolfgang Schad sets out to explore the way the forms of the different mammals show adaptive specialisations, and in the end returns to the human form as that which manifests unity most truly. The human being is unspecialised but differentiated in his configuration; and, as a corollary, independent from defined environments. This principle of emancipation from the environment, in the human being, reaches its culmination in the limbs. You can trace progressive emancipation of the organic systems of animal life from the first sensory cells of invertebrates through nervous system, respiratory system, circulation, warmth, reproduction to, finally, the limb system. All mammals have specialised limbs, which tie them to their environment. Their limbs are like tools. Especially through being upright and the freedom this gives to the use of the upper limbs and the hands, then we see the human form as expressing freedom. Here we see the principle of differentiation: Wolfgang Schad comments: “Is man then characterised by the limbs or the brain? It could in truth be said that the two characteristics are correlated and mutually condition one another. For in man alone the activity of the limbs has been withdrawn entirely from the region of the head, which has in turn become free to develop the upright face and arched forehead so characteristic of him” (MM, p 264). The differentiation that is spatially revealed in the human form is an expression of the development of the human being in time. Development proceeds from the head downwards as the adolescent finally arrives on the earth with the maturing of the metabolic-limb system and the reproductive system. This realisation of our form in time expresses our emancipation from the present moment as from our physical environment: we learn and plan and remember. Our form, in its development and its spatial differentiation, shows how we live in time. Wolfgang Schad speaks of his wish to understand “the way life organises itself in space” (MM, p 27) – and in his exploration of the biology of form he reveals how the shaping of life is not only about physical form interacting with various life-functions but also engages capacities of soul: thinking that is clear belongs to the bony head, impulse belongs to the unconscious activity of the metabolism. But always there is interpenetration. Wolfgang Schad ends the book with a verse by Rudolf Steiner which, as he says, gives “clear, succinct expression to the wholeness and interdependence of the three main systems and functions of man” (MM, p 276). In the limbs lives strengthening will. In the series of lectures to teachers which Rudolf Steiner gave at Christmas 1921 in Switzerland, at the initiative of a British academic, Millicent MacKenzie, he spoke about the human form, and I want to pick out a few thoughts of his which seem particularly relevant. He emphasises that the teacher should look, first, to healthy development of the child physically, because the soul and spirit will then be able to unfold out of their own resources. The freedom of the future adult depends on the teacher not damaging the soul and spirit of the child and he can trust the unhindered physical being of the child allowing the spirit to be expressed. This is important because the guiding ideal is “to place the human being into the world in such a way that he can unfold his individual freedom or, at least, that no physical hindrances should prevent him from doing so” (Lecture XII of SFWE). The development of the child continues on into adult life and is a process by which “gradually, the child takes hold of its body, finally incarnating right into its skeleton, and how, by doing so, it grows together more and more with the external world, how it learns to adapt to outer circumstances” (SFWE, p 207). This growing together is a growing together in freedom, and depends on living fully with the human form. Answering questions Rudolf Steiner speaks about the vertical spine and that this verticality is not just a fixed thing; it is not something that takes effect only when a person is actually standing up. It is the feature which allows him to become self-directing and self-conscious – “An ego can incarnate only if a being is organised in line with the vertical” (SEWE, p 341). This is a very important realisation, that the quality of upright verticality of the spine is something which can permeate the human being in any position. It can still be there when I bend although I am no longer vertical. It is still effective and active when a person lies down, or even, when they sleep. There is a beautiful little story by Anke Weihs, ‘The King and his Page’ (reprinted in The Little Sower of the Night) which tells of a King, oppressed by doubt and anxiety, who is helped by his page to sleep well and find the grace to live with his doubts and despair. As the troubled King sleeps a “tiny golden serpent” slips out of the King’s mouth. It seeks to cross a brook, and the page helps it by laying the King’s sword cross the brook to allow the fearful serpent to cross. And then in the morning, he lays the sword down again, this time pointing back towards the King’s sleeping body, to allow the serpent to return to the King and let him wake. The page’s dutiful thoughtfulness remains unknown to the King in his new-found joy and peace. In the image of the page and the sword laid on the grass I see the power of the uprightness of the individual, living in the human form, as carrying us into the worlds that may hold our fears. The King meets a figure in his dream who confirms that “To believe is to look beyond the shadow towards the light from which the shadow proceeds”. Verticality is about the spur to wakefulness, and wakefulness is not just the awakening into the clear day consciousness of the senses and the mind – the passage into the world of imagination, of a consciousness of the world we enter through dream, and in sleep, is another kind of wakefulness. In his last years Henri Matisse created the windows and the interior of the Dominican Chapel at Vence. 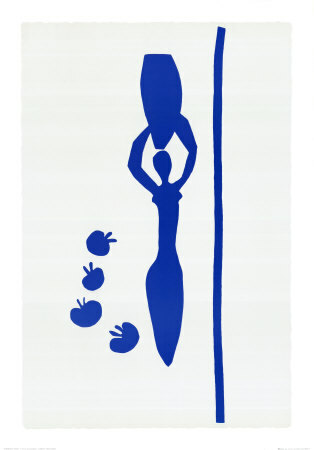 This was another kind of cut-out, Matisse saying that he cut the gouached paper as one cuts glass. Picasso was, apparently, furious with Matisse for creating a church – “Why not do a market instead? You could paint the fruit and the vegetables!” he is quoted as saying (MC, p 57). The theme for the windows was taken from the Book of Revelation – the river and the Tree of Life. It seems to say in Chapter 22 of the Book of Revelation that the tree of life is on both sides of the river. It does not belong to only one kind of consciousness. Matisse commented in reply to Picasso, “I don’t care: I have greens greener than pears and oranges more orange than pumpkins”. Colour is taking him towards transcendent simplicity. The chapel was the right place for Matisse to create his final expression of the spirit of creative purification which led him to the joyful clarity of the human form. One of his last big cut-out panels was of ‘The Thousand and One Nights’ and shows as Gilles Neret says “the magical creatures of the night in the most dazzling colours” (MC, p 77). The human form belongs there too, as well as in the sunlight streaming through the chapel windows. It is body and soul. It is the dancer and the dance.